Nubar's latest release for Fall 2011: the Polished Chic Collection is a pretty grouping of classic cremes along with a single shimmer. To begin, I adore the names of the colors! I would love to wear Beguiling Carmine simply to answer the question: What color are your wearing? The polishes I am most interested in trying are Vogue Vert and Mod Aqua. Nubar does an exceptional job with their pale tints of color. These shades are perfect as bases for nail art. Faded Putty will likely gather the most attention. I can't tell you ladies how often I get stopped on the street when wearing neutrals. What shades from Polished Chic are you most curious about? I would love to hear about your top picks in the comments. 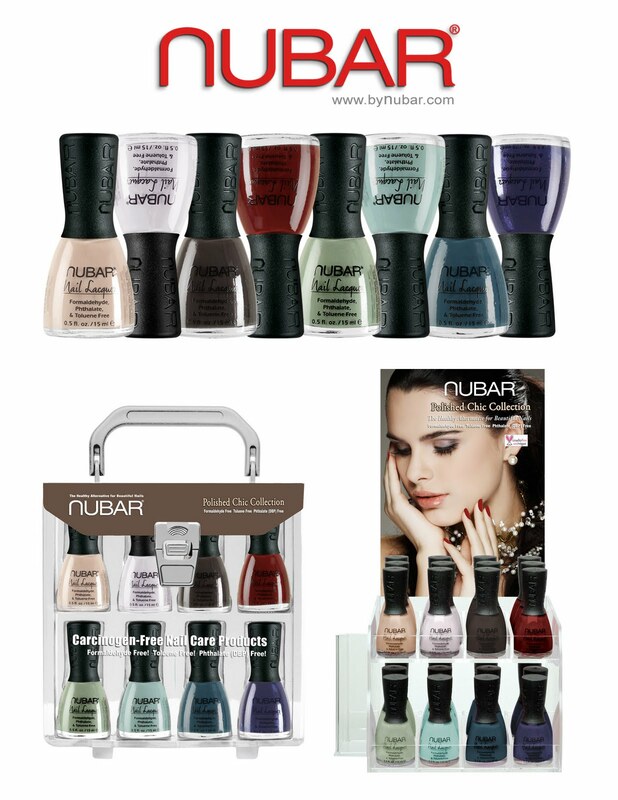 This season Nubar brings you eight new and enticing, fashion forward colors of our premium carcinogen and cruelty free lacquer with the Polished Chic Collection. Offering contemporary colors perfect for work, casual daytime wear or even a night out, every woman can look to Nubar's Polished Chic Collection to update her look. Classic Camel: an updated buff creme. Faded Putty: a modern, pale putty creme. Edgy Umber: a deep brown creme. Beguiling Carmine: a brick red creme. Vogue Vert: a contemporary, light green creme. Mod Aqua: a light turquoise creme. Stylish Peacock: a perfect teal creme. Elegant Indigo: a sparkling, blackened blue. I definitely need a new Brick Red creme as well as the turquoise and teal cremes. I can't ever pass up on blue cremes though, it's a weakness (aka addiction)! I'd pick Vogue Vert and Elegant Indigo as my favourites! Elegant Indigo and the brick red have caught my attention! None of the rest grab my attention. Elegant indigo = love at the first sight! Vogue Vert looks just perfect to me. Can't wait till this collection is swatched. Love Nubar polish.